Lightweight and usable on all types of cars. Good starting power and long-term energy. Quick recharge (under 6 hours). 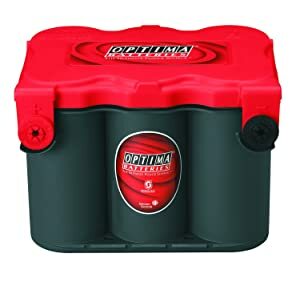 In this review we are going to asses Top 10 Optima car batteries. This company with 40 years of experience is one of the leading brands in battery production. Their Blue, Yellow and Red top batteries cover all types of vehicles and heavy machinery. This brand is well known for its tough resilient products. Optima batteries are produced in 3 categories and it is very important that you know them well and choose the right one for your need. BLUE TOP: DEEP CYCLE applications – RV’s, inverters, UPS systems, where you drain the battery dry then recharge it immediately afterwards. YELLOW TOP: (used in the H1 Hummer engine) – Has both deep cycle and engine starting ability. If you drain a NORMAL engine starting battery dead, you take between 5-10 percent of its life by doing so. The Yellow Optima batteries can manage discharging running lights and accessories with the engine off and still start the engine. You can easily recharge them provided they are not totally dead. RED TOP:These are just simple replacements for engine starting ONLY – they are NOT meant to be deep discharged and will suffer a shorter lifespan if you do drain them. They still have all the benefits of the Optima design of being sealed, vibration proof, and spill proof. Before I dip into my review I must mention that Amazon at least for the time being is not a good place to buy Optima batteries. Battery is delivered in poor packaging and there have been numerous reports of damaged batteries delivered to the customers. Therefor although it is cheaper to buy eBay, at least for the time being it is better to pay more and buy locally. 12 V – 800 cranking amps. Powerful 5 second starting surge. Works 100 minutes non- stop. Closely coiled construction minimizing the plate movement. Proven to be leak proof. 15 times more resilient to vibration in comparison to normal 12V batteries. Faster recharging in comparison to normal car batteries. Quick one day delivery in USA. Especially built for heavy use on vehicles working in rough terrain. The warranty offered is shorter than similar brands in the market. Optima Battery has produced this model to work in harsh and sever conditions. Therefore it should be resilient to vibration and able to kick start in extreme weather conditions. To judge this battery and its special features its best to asses its track record in the hand of the customers. They have given a 4.7 rating to it which by all standards is a fare assessment. I don’t have to go far, a friend of mine who has a 55 Chevy claims that it is over 10 years he is still using 8004-003 batteries. Further more in all these years the number of times he had to recharge it was less than 5. The same goes for another colleague of mine who has installed this battery on his 2001 Dodge Dakota, 6 years ago and after giving it a run of 130,000 milesit is still going fine and well. So my Verdict is if you live in a cold climate and want a tough battery I recommend Optima 8004-003 34/78 RedTop. Optima batteries come in 3 different color tops each tailored for a special purpose. 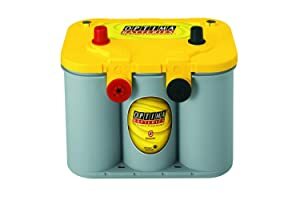 Yellow top Optima batteries are twin purpose batteries built for powering heavy electrical workload, such as winches and other car accessories. A reserve power capacity of 120 minutes. Delivered in US in 24 hours shipments. Creative Spiralcell Technology giving it a 15 times vibration resistance. Twice the lifespan of ordinary lead-acid car batteries. Successfully tested under heavy load. For example it can provide full power to 5 amplifiers (80-100) in addition to headlights. Good cranking power in extreme cold weather. Overall tough resilient battery for heavy work. 100% spill proof. You are able to install it in any position. Practical ingenuity by installing top and side connections. Able to store it for a long time. The warranty offered for only 36 months is very down graded. In short YellowTop 8012 is for trucks with winches, cars with high-demand electronics and audio systems, commercial vehicles and heavy equipment. Despite all the amazing features there are weaknesses which you should know. The warranty support is virtually non-existent. A friend of mine realized this fact when faced with a battery which was leaking. He called it a $200 lesson. Having said that, it is important that you understand the application of each of the 3 different kinds of Optima batteries. The Yellow Top provides both cranking amps as well as deep-cycle capacity. On these two counts I give 8012 full marks. This model just like the 8012-021 is in brief a Deep Cycle and Starting battery. This battery is designed for powering heavy electrical loads, such as winches, audio systems, inverters and all the other accessories that these days are added to cars. Spiral Cell cutting edge technology. 15 times more resistance to vibration. A low Self Discharge rate. A longer life span (two times). Deep Cycle & Crank Power. Ideal for powering heavy electrical loads. Low internal resistance resulting in more efficient power supply. Same day shipping in the US. Warranty only covers 36 months. Reports of damaged casing of the batteries on delivery. Having read all the features and the specific technical aspects of this battery, in my view it has proven its dual role as a Deep Cycle and a Starting battery. The customer reviews unanimously endorse this verdict. However there are weaknesses reported especially with the casing where customers are faced with broken or ruptured batteries. Finally the warranty provided by the company by no means matches the quality of the battery. The bottom line: I recommend it as a tough, quality battery. This is the Blue Top model of Optima products especially made for Marine use. Of course you must have in mind that the cost of thisbattery is substantially higher. However with this model you are able install it in any position you want and be sure that there won’t be any spillage. This feature alongside many other features listed below;provide a good performance in return for the additional cost. Spill proof. You don’t need to be worried in sharp turns. Delivering high current enough to run a compressor of an air conditioner. Special 6 pack design providing maximum surface area to produce the higher possible current. Completely sealed and spill proof. Therefore the terminals will never corrode. Lack of equalization chargers in comparison to wet cell batteries. This battery in tailor made for marine use. However because of its strong current I personally used it for my inverter. 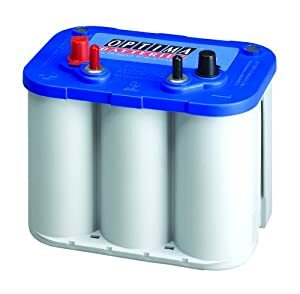 I bought two of these batteries and connected them parallel to feed a 2000 watt inverter and it just worked fine. My final verdict is that although you pay a higher price at the beginning you will save money in the long run. It is a 5 to 1 bargain in comparison to a normal battery. However not everything is perfect. The two Blue Top batteries which I bought after 37 months, one completely failed while the other is working just like the first day. This RedTop 4.5 rated Starting Battery is reliable and easy to install and you don’t need to worry about the amount of battery acid or the corrosion on the terminals. As like other Optima models using the Spiralcell technology this battery is much more resilient in comparison to traditional batteries. They would stand much tougher vibration. 12-Volt, 720 Cold Cranking Amps. Size: 10 5/16″ x 6 13/16″ x 7 5/8″ tall, Weight: 39.5 pounds. Excellent holding charge capability even in extreme conditions. Lack of good prompt customer service. Poor packaging on delivery. There have been several reports of cracked and broken batteries. The verdict for this battery like other Optima models: “a good quality battery”. However the warranty service is disappointing. I myself bought a RedTop in 2007 and in less than a year it was dead. I contacted the Optima customer service, they passed me to Amazon and there they made an outright response that they would not honor a warranty exchange. In addition to this concern the packaging of the product is in no way satisfactory. The padding used in the package is under the minimum requirements, resulting in cracked and damaged batteries delivered to the customer. Many customers recommendedbuying it locally and not online although it will work out more expensive. 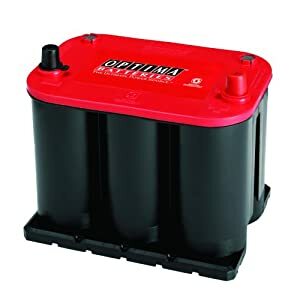 The Optima RedTop AGM battery is the decisive high-CCA starting battery designed to deliver the strongest 5-second ignition power for anunfailing start-up every time. The RedTop will outclass and outlive traditional batteries in demanding cranking&starting applications. Thismodel is ideal for trucks, SUV’s, and luxury cars. Strong 5 second stranding burst. 2 times longer life span. com at present is not the Optima retailer. Naturally they do not honor Optima warranty. A friend of mine needed a new battery for his 2002 Vette and on my advice instead of buying OEM Delco decided to buy a RedTop. It worked out cheaper for him and up to now has had his engine cranked with no difficulty even in extremely cold weather. To add to this after a month when he came back from his holiday the battery cranked the engine with full power, this happened when the weather was only 20f. On this personal experience and the good track record of Optima batteries I give it a thumb up. This model like other RedTop batteries will assure you the starting power you would need in extreme conditions. The closely coiled construction of the battery makes it resilient towards harsh off road vibrations. Also its leakproof quality enables you to install it any where inside the vehicle. One day delivery in US. Short life span in some cases. In my workshop I come across many of my customers telling me about their car batteries. 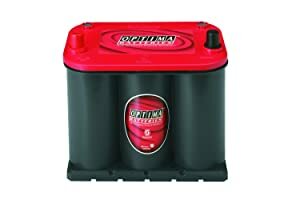 Last week one of them who had bought a8025-160 25 RedTop for his 07 Chevy Colorado, was so satisfied that had decided to buy same battery for his other 2 cars.My verdict is, a quality tested battery. 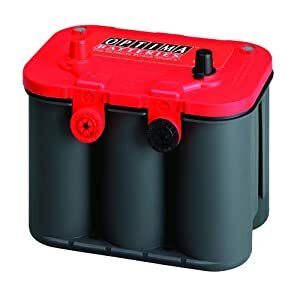 This battery is specially made for vehicles with extra accessories such as; head lights, audio and video systems, and winch apparatus.The battery is able to operate in nearly all conditions; dirt, moisture, extreme heat or cold. It is usedfor racing cars, luxury vehicles and any other vehicles which falls between these two categories. 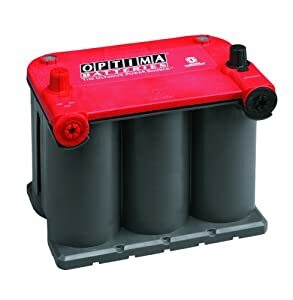 The Optima 8040-218-FFP 12-volt battery has a full 650 amps of cold cranking power. You get 98 minutes of reserve capacity for reliable performance. This battery provides optimal starting power even in cold and hot temperatures. Optima batteries hold a higher voltage throughout the discharge cycle giving it more stored power compared to standard batteries. 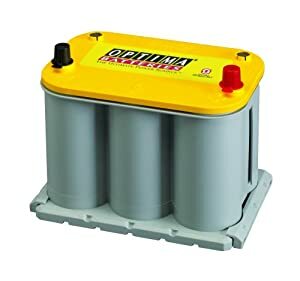 Optima YellowTop batteries have cells that are tightly compressed into supportive chambers giving them 15 times the resistance to vibration than standard batteries. Reasonable price in comparison to other AGM models. Terminal hardware is not provided on purchase. Warranty covers a short period of time. Not compatible with all hybrid vehicles. Nearly all customer reviews for this battery have been positive. However there have been reviews where the battery went dead after a short period of use. Surely these cases do arise but a good customer support system and a strong warranty procedure is the guarantee which would compensate for such mishaps. In my view Optima should upgrade this part of her operation in line with the quality of its batteries. If you have a car with numerous accessories such as stereo systems, winch systems, hydraulic systems and extra illuminating lights, you need a powerful battery to be able to fully support and feed such systems. The YellowTop battery with deep cycle capability and a strong starting ability is tailor made for your needs. 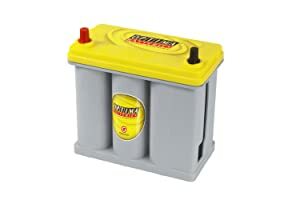 Genuine twin purpose starting and deep cycle battery. Twice the life span of traditional lead- acid car batteries. Fully sealed and 100% maintenance free. Spiralcell Technology providing 15 times more vibration resistance. The plastic handle causes problem in securing the car interior cover. The warranty only covers 36 months. Working with my clients I have come across some very positive responses about this battery. One was a client of mine who fitted a YellowTop on his 2008 Toyota Prius and he is really pleased with it since.I have to add negative reports too. One customer has mentioned that when he tried to connect the negative terminal it came out completely and some gas was also lead out too. This means the end of that battery. Having said all this my overall verdict is a positive one and due to my first hand experience and the contacts I have had with car owners this YellowTop Optima product is truly representative of the special features that the manufacturer has claimed for it. This RedTop model is built to deliver strong cranking power in extreme weather conditions. It is leakproof and designed on SpiralCell technology, making it ideal for heavy work load. This new technology in battery design gives you a longer storage power. A strong 5 second starting surge in all weather conditions. Twice the lifespan of traditional batteries. Due to Spiralcell technology can withstand 15 times more vibration. 100% spillproof, you can install it in any position you want. No terminal corrosion and no maintenance. Faster recharging in comparison to other batteries of the same caliber. Storage capacity of 100 minutes non-stop power supply. It can be installed in any position, even upside down. Pure lead component allowing higher starting power. The warranty is short lived. I personally bought a RedTop 87 for my 2000 GMC Sierra pick-up. Actually I don’t use this car very often so I thought it would be best to buy a battery which would hold power longer. For the last year or so every time I started my pick-up I could feel the power of the battery and had no problem what so ever. My Verdict: RedTop 8078is worth the money you pay for it. They use gel cell technology instead of liquid acid, this means they are spillproof. 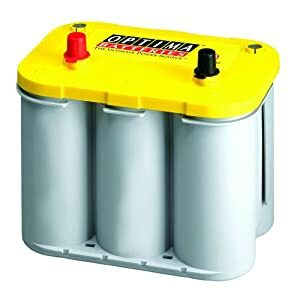 Optima has induced this technology into 3 categories with distinctive Red, Yellow and Blue top colored batteries, each with their own target users. RedTop: A multipurpose battery for everyday normal use. YellowTop: Everyday use with the extra ability to provide power for additional accessories on specific cars (sound equipment, illumination and winches). It is capable of heavy electrical loads and deep discharges. BlueTop: Specially designed and built as marine or RV use. Having researched about Optima batteries and personally experienced their quality I highly recommend this brand. How to install car speakers?